Despite my previous enthusiasm, I’ve decided that I’m done with this recipe. It’s just – boring. And it makes WAY TOO MUCH. And those two things are a bad combination in my book. Let me back up. The weather was brisk today, and I anticipated spending most of the day helping my friend Olivia move into her new house. I knew I wouldn’t want to have to think about dinner when I got home – and that Shane wouldn’t be home until later either. In hopes of avoiding a fast food dinner and also stocking the fridge for a week of solo eating, I took half an hour to prep dinner and get it in the crockpot before leaving for the day. After a morning of heavy lifting and maneuvering, a fair amount of pizza, and an invigorating moped blast around town, I arrived home not particularly hungry despite the wonderful smells coming out of the crockpot. I turned the temperature down and took a long hot bath. I read for a while. I pulled the short ribs out of the crockpot, coarsely chopped the meat, and added it back into the soup. 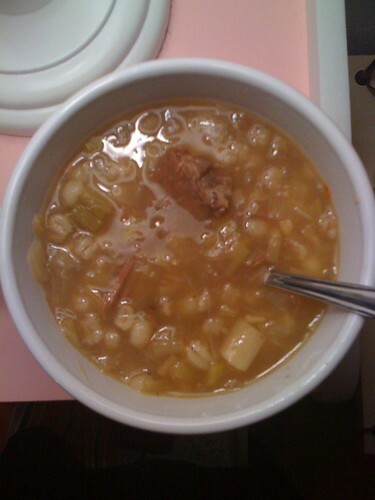 And then I measured out THREE QUARTS, ONE PINT, AND ONE SMALL BOWL of beef barley soup. Make that boring beef barley soup. I’m finding that it’s really difficult to accurately season large quantities of liquid destined to be in the crockpot for several hours. I’m not shy with seasoning, but I am concerned about over seasoning when the cooking is going to take place when I’m not around. As a result, this soup was a total snooze. I’m going to pick up some sherry to see if it will improve the flavor profile – but even if it does, we are going to be eating this soup all winter. How boring.